Standards are usually formed by cleaning a straight trunk to around 2 metres then forming up a head on the top. Sometimes on the same plant or by grafting on to a more reliable root and stem stock. They are formal, showy plants which are shaped from small trees or shrubs. Topiary plants are relatively easy to care for but do need regular pruning to maintain a neat and tidy shape. Topiary is often kept potted so will require regular watering and a high quality topiary compost. Using a specialist topiary fertiliser will reduce excess growth so less pruning is needed. The pruning of topiary is relatively easy, simply trim off any protruding branches using sharp shears. 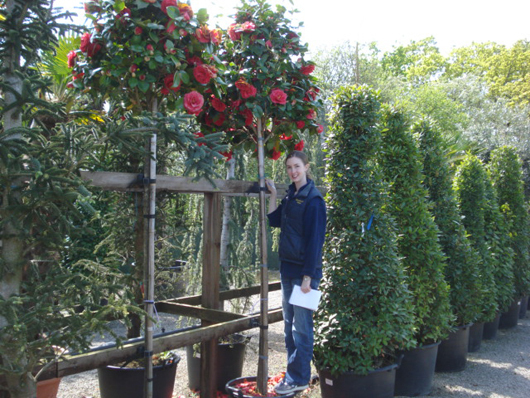 Topiary frames can be used as a guide to guarantee a perfect shape.